Website/social media: www.zackgiallongo.com. @zackules on Twitter and Instagram! Tell me a little about yourself: I’m a cartoonist, and a teacher, and a podcaster. I have a beard and I love animals and cheese. When you were my age, did you like to read and/or draw? : I sure did! I drew all the time with my dad’s office pens. What was your favorite story? : Probably any Narnia story with Reepicheep. He’s now tattooed on my arm. How do you get your ideas? : I have no idea! Is it hard to write and/or illustrate a story? : Yes, but most things worth doing are hard. And it’s such a great feeling to have it done! Do you have a favorite among the things you have done? : Probably my 2012 graphic novel, Broxo, about teenage barbarians and zombies. What is the coolest thing a fan has said about your series? I can’t think of anything specific, but I love it when kids draw art of my characters! Why do you think kids should read comics/graphic novels? Because reading is the best, and it fires up your imagination to tell your own stories, which fire up someone else’s imagination, and so on and so on! Any recommendations for kids? Mighty Jack, by Ben Hatke, Astronaut Academy by Dave Roman, and Boulder and Fleet by Jerzy Drozd! – Pop or soda: Soda, of course. 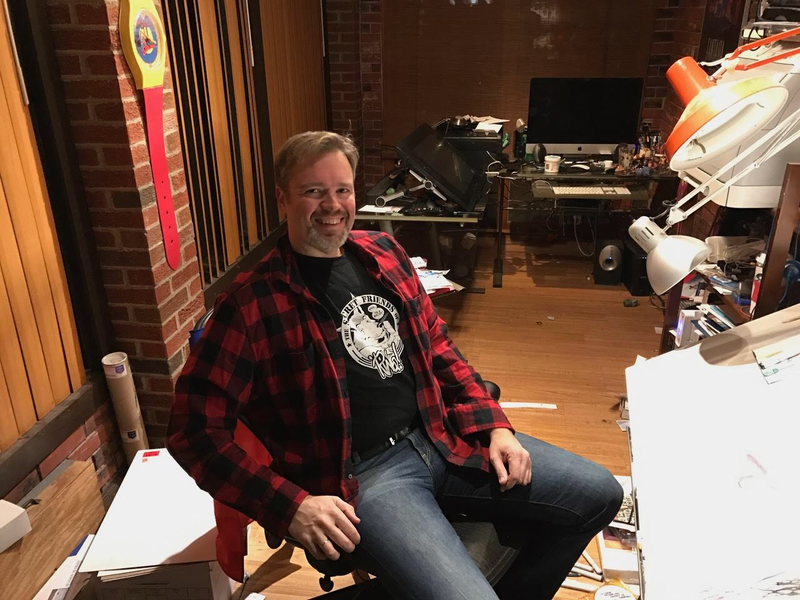 Tell me a little about yourself: I am an illustrator and college illustration teacher as well as a father of 3 girls and a husband to one amazing wife. I have lived in Columbus, OH since 2011. But I’ve also lived in Michigan, Idaho, Iowa, California, Illinois and Argentina! I like drawing monsters and using bright colors. My favorite TV show to watch and re-watch is the Pride and Prejudice BBC miniseries. How long have you been drawing? I have been drawing since I can remember. I drew all the time growing up and I always kept drawing, sketching and doodling on whatever paper was around through elementary school, middle school and high school. When I went to college I chose an art major because I couldn’t imagine life without drawing. One of my favorite things to draw when I was a kid was Bilbo Baggins from the 1977 Hobbit cartoon. I had a copy on VHS tape and I would pause it and draw the characters. How did you get into comics? I have always loved comics, from before I can remember much else. I made my own in middle school and high school and I’ve kept making them in college and afterward as well. Most of my comics have been self-published. What is your favorite comic you have worked on? My favorite comics I have worked on are my Pink Bunny Self-Help comics. Using a style similar to Scott McCloud’s informational comics (like Understanding Comics) I drew a Pink Bunny teaching the reader about positive affirmations and stress. I’m working on one about traumatic memories right now. What is the coolest thing someone has said about your work? The coolest thing has to be the people online that said the Pink Bunny comics helped them to feel better about their life and to make positive changes to try to be happy or happier. I made art that is fun for many people to look at, but that is the first time my art made someone have a bit of a better life. What are you working on right now? Right now I’m working on 3 comic projects. One is a new addition of “The Legend of Acornhead” that we released online a few years ago. My collaborators (Keaton Kohl, writing and inks, and Stefan Jolet, colors) and I are editing the first issue and pitching it to publishers. The second is a short book of my Pink Bunny Self-Help comics. And the third is a funny/strange story about something strange that happened to me when I lived in Argentina. When I was 19-20 years old I was a missionary for my church, the Church of Jesus Christ of Latter-Day Saints (also known as Mormons). I was in northern Argentina. One day another missionary and I walked by a guy who started yelling at us, then he ripped ort glasses off our faces, slapped me and punched the other missionary. We had to walk away, without being able to see, 5 blocks to the police station and report the theft of our glasses. It was strange, but the man was eventually brought in and shockingly didn’t harm our glasses. We were able to walk away without any problems. I know some other comics artists who went on missions as well. We all had at least a few strange things we either did or happen to us when we were there. 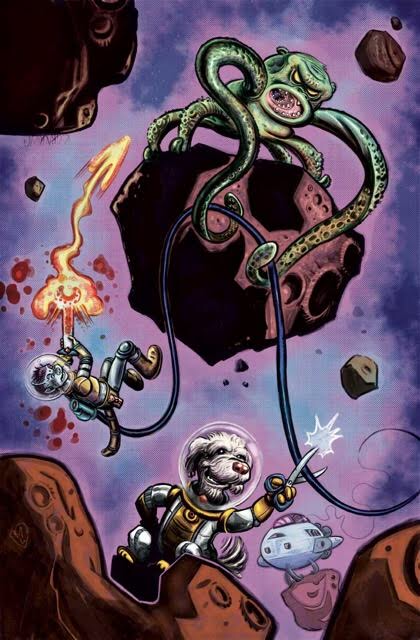 We are planning to create an anthology of these comic stories and run a kickstarter to fund the printing and shipping. Look for more information (and who the other artists are) in the next few months. Why do you think kids should read comics/graphic novels? When I was a kid, for a long time I thought that The Hobbit and the Lord of the Rings were the only good books. So I didn’t read other things and I missed out on other things I would have liked. If kids only read books or only watch cartoons or only watch movies they miss out on all the other ways to enjoy stories. Kids should be willing to try comics because experiencing a story in a new way can be fun, just like I learned that tons of other books were amazing, not just the ones by JRR Tolkien. What are some all-ages comics you suggest? I have been loving Cucumber Quest by G.G. Digi (a webcomic, soon to be officially published) for a long time. I also like Sam Bosma’s Fantasy Sports series. Bone by Jeff Smith is my favorite comic series (and I live in Columbus, where he lives! I got to meet him a few times and he is really great!) COWA! by Akira Toriyama, the guy who made Dragonball is super fun. And I also like to point out to people that children’s picture books are just comics with 1-panel per page. And there are tons of great picture books out there. – Pop vs soda? I saw Pop because my family is all from the midwest and I have lived most of my life in the midwest. Tell me a little about yourself: Hi I live near the vibrant City of Leeds in the UK with my partner Vicky and little girl Rosanna, I also live very close to the countryside which we all love to explore whenever we can. There are lots of arty people in my family and I naturally had a love of drawing from an early age, inspired by comic books and Warner Brothers and Disney cartoons. I’ve worked in the creative industry for over 10 years mainly working in greetings cards (with a highlight being illustrating a range of Star Wars cards) and only recently had the pleasure of illustrating childrens books. I like to keep up to date with the latest cartoons and children’s books, and adapt my style by introducing elements from new sources of inspiration. When I’m not illustrating I like spending time with my family and friends, music, films, video games, walks in the countryside and attempting to play guitar. How long have you been illustrating books? It’s been about a year and a half, I remember because that’s the age of my daughter and I was first asked to illustrate the Super Happy Party Bears a week before she was due to be born (it was a very busy time in our household) so far there’s been four Super Happy Party Bears books published and four more due out pretty soon so it’s all happened very fast but it’s been a really fun experience and I love working in this industry. How did you become a book illustrator? iMPRINT Macmillan Publisher’s saw some of my work and contacted my illustration agent at Advocate Art who asked me if I’d like to be involved in the Super Happy Party Bears books. The piece of artwork I think they particularly liked was originally from a page in a calendar I illustrated which was very in tune with what they were looking for. How do authors pick their illustrators? 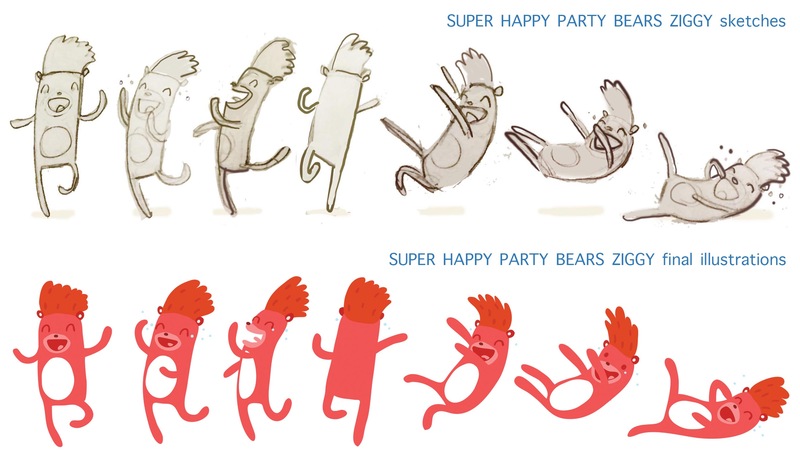 In this case it was iMPRINT Macmillan Publisher’s who came up with the idea for Super Happy Party Bears then they contacted Marcie Colleen to write the books and me to illustrate them, it’s been a team effort. How do you know how to illustrate a story?For the Super Happy Party Bears I was originally given notes on the story outline, characters and setting and then drew sketches of how I thought the characters should look, I thought to have the party bears look as colorful and fun as possible like a rainbow and the grumpy woods towns people to be more drab colors but still keep all the characters looking different from each other so they are instantly recognizable, this then partly influenced how the books were written by Marcie. From that point on for each new book I get a list of characters, objects, scenery then draw everything separately so that there is a library of images then the artists at iMPRINT put everything together with the words and they design how everything goes together on the pages. Do you have a favorite book you have illustrated? My favorite Super Happy Party Bears book so far is ‘Going Nuts’ as I like the Goonies style adventure Marcie has written and the Chipmunk cops, I also really enjoyed drawing the punk characters in Bat to the Bone which is due out this August. Do you illustrate by hand or by computer? I do a bit of both, I usually draw everything in my sketch book first then redraw the characters in color on computer. 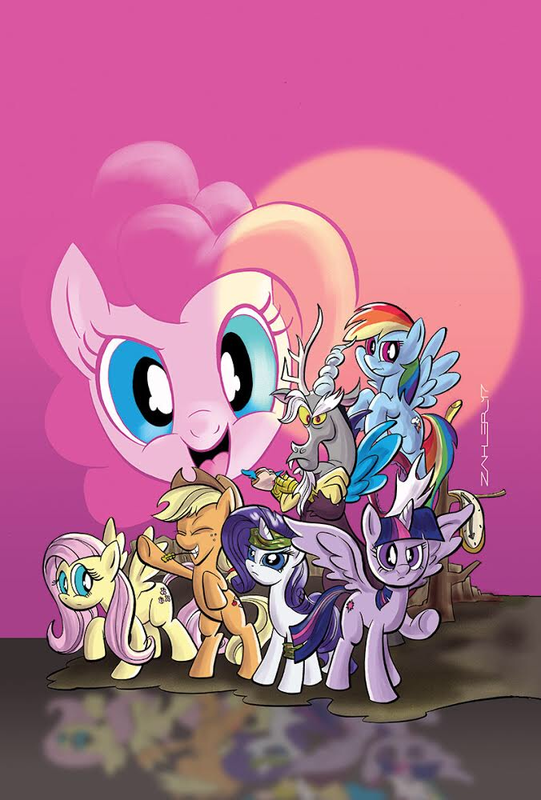 At Motor City Comic Con, I had the chance to meet some of the illustrators of My Little Pony comics. I love that series so much and even have a subscription to it. 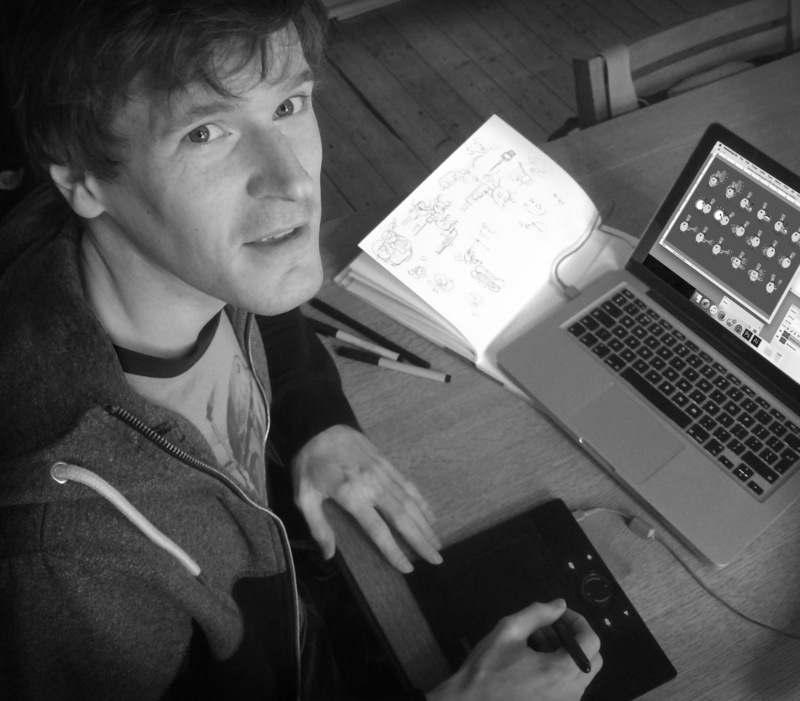 Today, you get to meet one of those illustrators! How long have you been drawing? All my life. I don’t remember a time when I wasn’t. I’ve known I wanted to be a cartoonist from my earliest memory. There’s no time I didn’t have a pencil in my hand. How did you get into comics? My parents had a reward program when I was a kid. I was well behaved, I got a comic. My parents had a really well-behaved kid and I had a lot of comics. So that fostered my love of them. I went to the Kubert School in New Jersey and trained as a cartoonist there.I was a better letterer (back when that was done by hand) than I was anything else, so I got some lettering work while still in school. I freelanced on the side for a few years, lettering and inking here and there, before self-publishing in 2002 and my career sped up from there. What is your favorite comic you have worked on? I always hope my last one is my best, because I should keep getting better. That said, my Love and Capes books are a favorite, They launched my career in so many ways. Mark and Abby are like dear friends and I hope one day I can figure out a story to bring them back. Tell me a little about yourself: I’m a professional illustrator that does comic books, children’s books, and illustration work for companies. I also teach workshops for kids and adults on Visual Storytelling. How long have you been drawing? Since as long as I could hold a pencil. How did you get into illustrating? My parents owned an advertising agency when I was a kid, and when I turned thirteen they let me draw a cover for a tv guide like magazine they put out. It was terribly amateurish, but super cool to see my art in print for the first time. I’d always been drawing, but that was my first taste of commercial work, so I think that idea stuck in my head when I went to university. In school I studied fine arts with a concentration in graphic design, so I took jobs related to that in college and after I graduated. I did some spot illustration and concept art as well as toy package design but it wasn’t really making me happy. What I really always wanted to do was comic book illustration, so about 10 years ago, I went back to school to focus on illustrating for comic books. I’m so glad I did, because it’s been really gratifying to create stories with my mom and other writers and to do illustrations for families and friends. And to make a living at it! What is your favorite book you have worked on? Whatever I’m usually working on becomes my favourite book most of the time, however if I had to choose, it’s probably my latest Up-In-The-Sky book Above A Planet Named Up-In-The-Sky. I think me and my mom knocked that one out into space (pun intended)! What illustrators do you like? I was classically trained in fine arts, so I always loved the paintings of the renaissance artists like Michelangelo and Leonardo Da Vinci, but illustrators really came into their own during the golden age of commercial art in the early parts of the 20th century and that’s where I’d begin to choose the ones I like. So artists like Mucha, NC Wyeth, Norman Rockwell really inspired me. There were also classic comic strip artists I liked such as Alex Raymond, Austin Briggs, Hal Foster and classic comic book artists like Joe Kubert, Wally Wood, Jack Kirby, and John Buscema to name a few. Modern artists like Mike Mignola Bill Sienkiewicz, Lee Weeks, Dan Panosian and many many others are also in this list. There are just too many to count! I’m a graphic designer by day, and a storyteller by night. I self published my first book in 2013, called “The Rocket”. Immediately following that, I was asked to illustrate the fun “Scratch9” series by author Rob Worley. That book was published by Hermes Press in 2015. How long have you been drawing? Like most kids, I was sketching as early as five. (At least that’s what I remember) But as I got older, I realized that we all didn’t keep up with drawing everyday. I just loved making art, and drawing the cartoons I was watching. Even now as an “adult”, I’m still drawing everyday, and thankfully seeing improvement for it. How did you get into comics? I think the first memories I have of loving and reading comics, was tearing through the newspapers to read Peanuts and Garfield. Favorite comic that I have worked on? That’s tough. I loved what I learned from “The Rocket”, and I loved working with Rob on “Scratch9”! I’d hate to give that classic answer of “Whatever I’m working on now”, but I’m super excited for the new book that I’m starting. Why do I think kids should read comics/graphic novels? I think EVERYONE should be reading comics and graphic novels. Old guard librarians tend to think of comics as a jumping off point to “real books”, but they fail to realize that comics read completely different than the traditional novels they push so hard on younger readers. Comics engage both sides of your brain at the same time, it’s a complex skill to build and master. People who struggle with using both sides of their brain tend to write off comics as garbage because they can’t read them, literally. To be honest, I also struggle with this. I have a hard time engaging in conversation at a table, while I’m drawing, or reading. I’m a single task guy, but I’m also a single sided brain guy. Reading comics is a skill that I work to perfect everyday, because it’s full on brain engagement that taxes me if I do it too much. When I read articles or pages without pictures, or a visual narrative, I force myself to slow down, process what’s happening, understand it, and move on. There are also TONS of things that comics do so well, that ONLY comics can do! They can create visual flow on a page that drive a story. They can tell us all about a scene without saying a word. They can convey sound effects with uncanny pizzaz. They can universally communicate a single idea across language barriers by using visual cues and icons. What are some all ages comics you suggest? Ohhhhh I love talking about other artists’ work! – Anything Ben Hatke. Like Zita the Spacegirl, and just read everything. – Anything Faith Erin Hicks does. For real. Friends with Boys, Superhero Girl, and – – Anything Can Possibly Go Wrong are GREAT places to start. – I’m not sure if Usagi Yojimbo is all ages, but from what I’ve read, it is so far. – Jay Fosgitt’s Bodie Troll is delightful. – It’d be dishonest of me not to recommend a Japanese manga, so I’d read Yotsuba, by Kiyohiko Azuma. It’s a charming series about all the new experiences in our world, from the perspective of five year old Yotsuba. That’s everything that comes to mind right now. When you were my age, did you like to read? Yes! I used to stay up late every night and devour the Nancy Drew mystery stories. What was your favorite story? My number one favorite was THE CLUE IN THE OLD STAGECOACH. I know what the cover looks like, and I probably read it 100 times. But now I can’t remember the storyline! Both of my author-illustrated titles, PAX AND BLUE and BUNNY’S STAYCATION (coming in 2018), came from real life things that were happening in my family or with my children. There is so much inspiration in our everyday surroundings. The most important thing about making books is being a good observer and paying close attention to the world around you. Ideas are everywhere! Is it hard to write a book? Since I consider myself an illustrator first, it is very hard for me to write and I have to go through many, many drafts. I’m good at thinking of ideas, but turning them into a whole story is something else. It can be frustrating, but all the do-overs ALWAYS make the book come out better in the end. It’s really important to keep at it and keep trying, especially if you really believe in your story. As an illustrator, how do you get matched with an author? An author’s manuscript is received by the editor, who works at the publishing house. The editor then meets with the art director and they go through illustrator portfolios and websites to find an artist they think will be a good fit for that story. The editor sends the manuscript to the artist for review. If the artist likes the story and is available to do the work, it’s great news! Do you have a favorite among the books you have written/illustrated? That is so hard for me to choose. I love PAX AND BLUE because it is my first book, but I also love BUNNY’S STAYCATION because it addresses an issue that so many modern families face — a parent who has to travel for work and leave their child at home. I hope my book helps little bunnies everywhere with that tough situation! How many books do you work on at one time? I have 3 books coming out in 2018, so the past few months were a little tough for me with a lot of work to do. I prefer to only work on one book at a time, but sometimes schedules overlap and I have to get all the work done anyway. It’s a good thing the work is so much fun! What author do you really like right now? I am really obsessed with Jon Agee’s book LIFE ON MARS. I love it so, so much. I think it is a perfect book. What advice do you have for a kid who wants to be an author? drawing. Keep dancing. Keep singing. Keep creating. Don’t lose the joy you find in your art, you’ll carry it with you all the way to being a grown-up. Annoying Little Brother question: how excited are you to be working with Tim Kubart? How did you get matched with him? Haha! That is not annoying at all. I am VERY excited to be working with Tim! I haven’t met him yet but I can’t wait to! Our editor Nancy Inteli at Harper Collins thought my art style would be a nice fit forTim’s story. I read it and loved it, and the rest is history. Look for our book, OOPSIE-DO, next spring!